For some, not having a gas or electric stove to cook on can be scary. For others, it is a fun adventure and should be looked as such. There is nothing wrong with learning new ways to cook. Many people in today’s economy do not have the money to pay their bills and will, if they haven’t already, lose one or more of their utilities. So not only can this be fun, it can mean the difference between hunger and your next meal. Back when I lived in Oklahoma, we use to have some seriously bi polar weather. One day it was tornadoes, the next an ice storm. One year, we had a particularly bad ice storm and we were without electric for about 4 days. At first, my only thought was, “They will get it fixed soon,” and then on the second day I realized they couldn’t even get to us. We lived in an apartment where we weren’t allowed to grill, so being able to cook for my kid’s and myself was out of the question. I then began to inventory everything we had to eat. First the cold stuff, and then the pantry items. The realization that I might not be able to feed them if we were without power slowly set in, and I began to really worry about how much longer we would be without power. Mentally, I began to prepare a list of things and ways I could prevent this from happening again in the future. As always, having more than one back up plan is the smartest way to go about planning. This was the beginning of my research into preparedness, which lead me to being the prepper I am. There are so many other ways we can cook alternatively than gas or electric. The first that came to mind for me was a grill. As I said, we were in an apartment so we were not technically allowed to use a grill but, I spoke with the manager and she said in situations like that it would be acceptable. We went and bought one of those small foldable grills that you can store flat in your closet along with a big bag of charcoal and lighter fluid. I think I ended up paying about $10.00 for the grill because it was winter time. (This is also a great time to stock up on charcoal, because they don’t sell as much in winter so it goes on sale.) Typically this sort of grill averages $30.00. Just make sure you have cookware that can be used on the grill. I prefer cast iron, but for smaller grills, the weight of them might be an issue. Another way to cook, although food types would be somewhat limited, would be a pocket stove. This is a very small fold-able stove that could heat several cups of boiling water in a matter of minutes. We now store soups, (both powdered and canned) noodles and things like pork and beans. You want to store some food that can easily be cooked with only boiling water or fit in a small tin cup. Pocket stoves usually come with fuel tabs that will burn anywhere from 5-15 minutes or you can purchase them. I prefer Esbit Fuel tablets or Coghlans fuel tabs because it has been proven they will burn for approx 9-15 minutes. You can also use wood strips with regular tinder to boil your water. Camp stoves are also very popular. These come with many different types of fuel sources to cook on. Propane and liquid fuel being the most popular. Everyone’s budget is different and these are some things to consider before coming up with your back up plans. The area you live in and how quickly your electric or gas would come back on should play an important factor in your choices. If you feel it would take them longer to get to you, then you wouldn’t want to rely on a small can of propane. I myself, still prefer an alternative that won’t make me rely on fuel, but to each his own. The pocket rocket is a favorite of many. Propane stove. Liquid Fuel Stove. Duel Fuel Stove. A fire place/pit or a natural wood burning stove is also an excellent way to cook food. We use to have a wood burning stove in an old house of ours with a flat top and that came in very handy to cook on. There are tons of different ways to cook on one. Make sure you have some cast iron skillets or pots though, because to cook on a wood stove with high heat takes some heavy duty cookware. (Don’t forget your pot holders!!) Both of these methods also provide heat for your family as well. There is nothing like the smell of wood burning. 🙂 Stove Tech also makes an amazing 1 door wood and biomass burning stove that has only gotten good reviews from our prepper friends. We recently purchased a solar oven and have been experimenting with it. The solar oven is specially designed to be used to cook your meal in the sun so it isn’t ideal for things you want cooked quickly. So far we have used it to sun dry tomatoes, to make breads/cakes, to make meat loaf and to bake chicken and rice. You can even make cookies! The down side to the solar oven is that it is harder, but not impossible, to cook on a cloudy day. It comes with a thermometer in it so you can see what your temperatures are inside of the device. This also makes cooking fun for the kids and it is something you do not need fire or fuel for. It can be a little pricy depending on the kind you buy, but you can also build yourself one for fairly cheap. At the end of this article I will put up a few recipes you can use for one of these to. Then of course, you have the time honored tradition of cooking over a campfire. While you can only do this outside of city limits, its a lot of fun to do and will also provide you with a relaxing place to sit and stay warm in the cooler months. I can’t even begin to tell you how many ways you can cook on a campfire. You can use a tripod to hang a pot from, you can use stones and place a grill across them to create an area above the fire. (My personal favorite.) If you have an imagination, the possibilities are endless. Just remember, with any type of fire, safety first. Have a burn kit in your first aid supplies and a fire extinguisher nearby. So as you can see, even if the economy fails to provide you with the means to cook for your family, you can prepare now and be able to do this all on your own. I use to be afraid that we would lose power and now I *almost* look forward to it so my children and I can have a short lived adventure. 🙂 Being prepared for any disaster will put your mind at ease on a day to day basis knowing your family will be safe and it will make the disaster less stressful in the long run. I hope this will help get you started on your back up plans to cooking! Wash and dry the breasts on paper towels. Rub each piece on all sides with the olive oil. Place 2 tbs. of the olive oil in the bottoms of each of the 2 Sport cook pots and coat the entire bottoms. Add 2 breasts to each pot, divide the sauce ingredients between them and salt and pepper to taste. Pour 2 more tbs. of olive oil over the ingredients in each pot. Mix the contents of each pot well. Cover the pots and place into the Sport solar oven. Clip the clear lid to the oven. Face the oven toward the sun and relax. This dish will be done in 1 – 2 hours, depending on the sun strength. Serve at once. No extra water is necessary and should not be added-the Sport oven retains the moisture of cooking ingredients. Add all the ingredients to the pots and mix well. Put the top on the pots, the pots in the oven. Clip the clear lid to the oven. The oven should be aimed at the sun, so that the sun shadow is straight behind the oven. Next rotate the oven clockwise 30 degrees. There is no danger of fire and the oven will not overcook this dish so it may be left unattended for as long as necessary. It would help, but is not mandatory, to re-point the oven at the sun and then do another 30 degree rotation at about 1:30 PM to optimize sun power. 4 each, 1/2 pound, fresh fish steaks, 1–1½” thick (Fish fillets – any shell fish, tuna, salmon or any white meat fish. 1. Wash the seafood under cold running water. 3. Wash the fish again under cold running water and dry it on paper towels. Place 4 fillets in a Sport Cook pot. Put ¼ of the sauce ingredients on top of each fillet. Cover the pot(s) and place into the Sport solar oven. Clip the clear lid to the oven. Face the oven toward the sun with the shadow directly behind the oven and relax. Do not open the oven to check for doneness until 45 minutes have passed. The fish will be done in 45 – 75 minutes, depending on the sun strength. Serve at once. 30 Comments on "Alternative Cooking: Cooking (and Recipes) Without Gas or Electric"
And please, please, please remember….if you are using a camp stove or charcoal bbq…ANYTHING that emits gaseous fumes…TAKE IT OUTSIDE!!! DO NOT USE IT INSIDE! Far too many people have died needlessly or lost their homes (and sometimes pets and loved ones) because they used these items indoors. Even if it’s freezing outside, it’s better to get a chill than to accidently kill. Having friends and acquaintances that are first responders, these are some of the worst calls they arrive on. Be safe! wow! i never would of thought of that. i just sort of thought people would know better. thanks a bunch for the great advice! These are are viable ideas. Whatever you choose as your backup source, be sure to have more than enough fuel to not only cook but boil water for drinking and even sanitizing. Last week we built a rocket stove from 1 1/2 cinder blocks. Google “redneck rocket stove” to see one like it. We fuel it with a pile of small branches from tree trimming earlier in the year, but if you have some land you’ll probably have an endless supply of deadfall. We cooked swiss chard from the garden with bacon and onions in a large skillet on it while grilling some pork chops on the bbq. What a useful little contraption the rocket stove is! Also, being from Oklahoma, I created an emergency wood burning stove from 2/3rds of a 55 gallon drum. Works great! Lighter weight than most charcoal stoves, when transporting it, it can be turned upside down and other items packed inside it. Have less than $10.00 invested in it. If anyone is interested, email me and I’ll send photos to you. Cooking on a wood stove gives ur food a wonderful flavor. I have a Franklin wood stove and the top is so insulated, it does not get hot 🙁 I’m saving for a solar oven … living in FL, we’re rarely without sun. I love using my Dutch Oven on the campfire! So much you can make! And why does everything taste better when you cook it outside over a campfire? I have been practicing alternative cooking for quite a while. Real food-although do havesome homemade MRE’s for quick meals and BOB. Fire pits are wonderful for cooking over.. Love that smoke flavoring! We do a lot of outdoor cooking; even in winter. I made a wood fired stone grill with an attached fire pit, and it’s constantly in use. Thanks! That *was* a small wood burning furnace that I got for free. I cut off the top, fitted a grate, then wrapped the whole thing in cement blocks. I filled the blocks and gaps around the stove with sand, then added an outer layer of stone and mortar. The heat retention is amazing. We’ve cooked on it, made applesauce on it, and also used it for water bath canning. 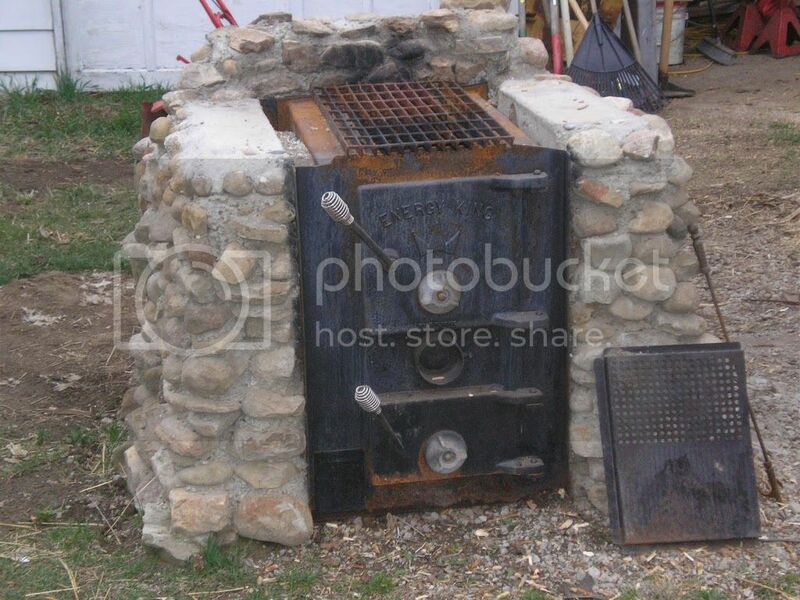 my ex hubby just sent me photos yesterday of a wood burning stove he fashioned out of a metal barrel. He cut holes in it, made a door and then wrapped it with another sheet of metal and put a layer of sand between the two. lol sounds similar to a trash burning barrel my dad made when I was a kid. Love cooking in the outdoors. If it’s a chaos situation, and you are cooking outside, I would consider using propane if you have it and boiling everything to keep the smells low and less traveling, to avoid attracting hungry people that may not be nice.